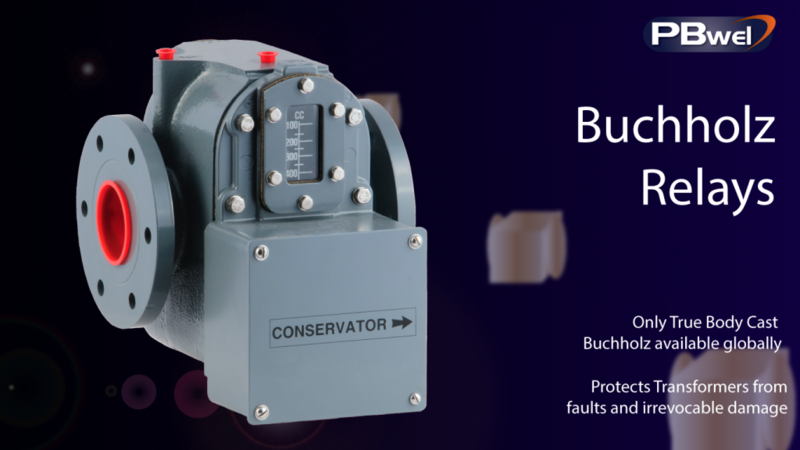 PB Buchholz Relays are one of the only true cast body types in the world, developed in conjunction with the British Central Electricity Generating Board (CEGB). Most faults in an oil filled Transformer are accompanied by the generation of gas. By using a suitable relay the formation of this gas can be used as a warning of a developing fault. Double element relays can be used for detecting minor or major faults. The alarm element will operate after a specified volume of gas has collected to give an alarm indication. The alarm element will also operate in the event of oil leakage or if air enters the cooling system. The trip element will also operate if a rapid loss of oil occurs. The relay should be mounted in the connecting pipe between the transformer and the conservator tank. This pipe should be as long and as straight as possible, and must be arranged to slope upwards, towards the conservator, at an angle within the limits of 3 to 7 degrees to the horizontal. There should be a straight run on the transformer side of the relay of at least five times the internal diameter of the pipe, and at least three times this diameter on the conservator side. A machined surface is provided on the relay body for the purpose of testing the mounting of the relay, both in the inclined direction and at right angles to the pipe where it should be horizontal. The terminal boxes on double element relays are normally drilled and tapped M20 x l.5mm for bottom entry by conduit or cable gland. Side entries and alternative thread sizes can be supplied for most types upon request. Alarm and tripping circuit connections are made to OBA terminal stems, in the terminal box, and secured by OBA nuts and washers. The maximum recommended torque value should not be exceeded when making connections.